This is a creamy, creamy and delicious version of mac n cheese with a little zip and zest mixed in! Balance the zip and zest with some black beans and corn and you’ve got the perfect one dish dinner! So many homemade mac ‘n cheese recipes call for making your own cheese sauce. This can be intimidating, I know. Which is why I created this recipe for you…no homemade cheese sauce necessary. This recipe calls for sour cream and shredded cheese to make the creamy-cheesy sauce. Cook the pasta noodles as directed. Drain. In the same pot, stir together the sour cream, Rotel diced tomatoes, black beans, and corn. Add the noodles back to the mixture and stir in about 1 1/2 cups of the shredded cheese. Warm until heated thoroughly and cheese is melted. Use the remaining cheese to top off each serving. 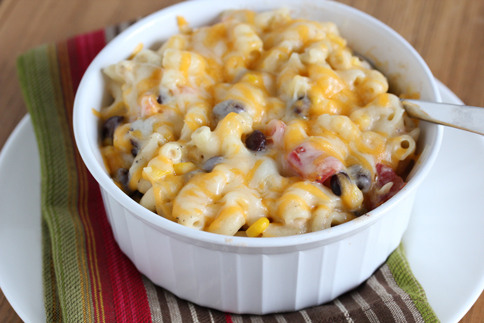 Serve Southwest Macaroni ‘n Cheese warm. Deep Steam Table Foil Pans 30 ct (8.5 x 10.5 in.) – perfect for casseroles, enchiladas, etc. Aluminum Foil Loaf Pans 10 ct (8.5 X 4.5 X 2.25 in.) – perfect for meatloaf, breads, etc. Follow $5 Dinners’ board 31 Days of Freezer Cooking Recipes on Pinterest. While I love being in the kitchen, I need to make my time spent cooking as efficient as possible…and how I accomplish that is with batch cooking, freezer cooking and keeping easy and quick meals or ingredients ready to go in the freezer. This month, I’ll be sharing all my favorite freezer cooking recipes, tricks, hacks and how-tos. See all of the 31 Days of Freezer Cooking recipes and tips here! Silly question, but do you just freeze after making?